One will not often have to delete an entire database table, for largely the same reasons as were outlined above for fields. If this does have to be done it is important to remember that one’s own customer-specific tables are the only ones which can be deleted, SAP de-livered tables cannot be deleted. Because ZEMPLOYEES3 has only just been created, and nothing else depends on this table, it can be deleted without consequences. 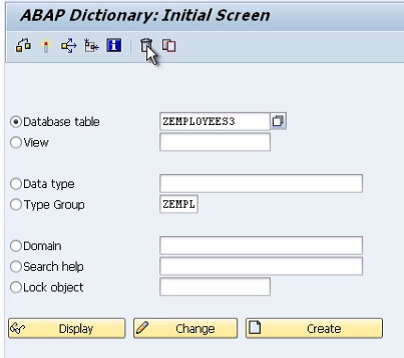 To check whether a table can be deleted without causing unintended consequences else-where in the system, return to the ABAP Dictionary’s initial screen. Because the original ZEMPLOYEES table was used in the programs which have been created, use this as a test. Having done this, one now knows that if the ZEMPLOYEES table were to be deleted, these programs would become inactive. By double-clicking these entries, one can see the code in the program where ZEMPLOYEES is referred to, and if you double-click on any line of the program, it will open the program at that line of code in the ABAP Editor. The Where-used button is a very useful tool, which can be invaluable not just when deleting pro-grams, but in many other scenarios. If you were to try to delete ZEMPLOYEES, the system would not allow this course of action and would prevent it from happening until all the programs that are dependent upon it were either edited to remove references or deleted altogether themselves.